Grist -- That number is zero: Since the nation’s first bikeshare program launched in 2007 in Tulsa, Okla., 36 U.S. cities have followed suit and started sharing programs of their own. Not a single death has been recorded. Remarkably, that statistic holds true even in major cities like New York where helmets aren’t provided with bikes, says Barbara Goldberg at Reuters. While there isn’t a central database for bikeshare accidents, Goldberg spoke to a range of transportation experts who confirmed the lack of fatalities. 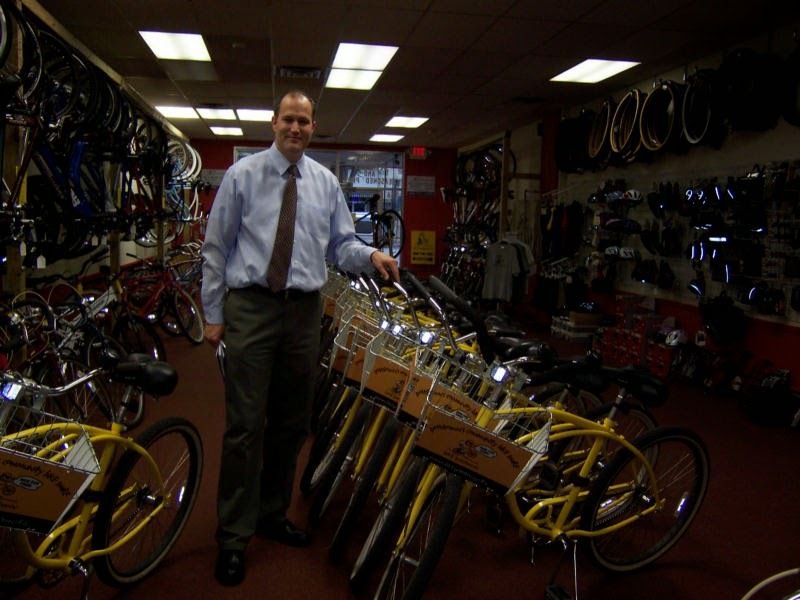 Newark Principle Planner Mike Fortner poses with the Bike Pottstown (PA) bike share, which may just be the closest system to Newark. It is tremendously successful and sees thousands of trips annually - and Pottstown isn't even a university town. Will Newark ever get on board with a bike sharing?